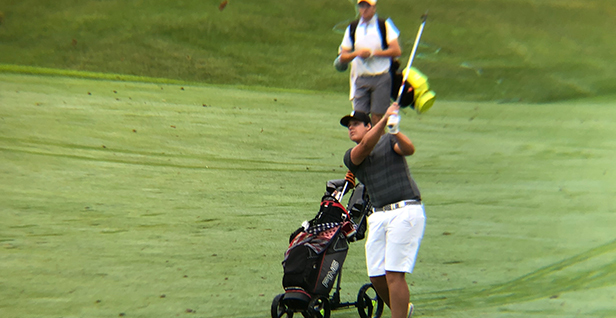 Silvis, Illinois – the first round of the John Deere Classic Junior Open, for boys and girls age divisions 14-18, took place on Monday at TPC Deere Run. The Girls 14-15 age division currently has a two-way for first place. Erika Holmberg and Lirui Guo both recorded 85s in the opening round, giving them a three-shot lead over the next closest opponent, Rylee Heryford. Paige Hoffman sits atop the girls 16-18 age division after carding a 5-over-par 76 on Monday. Hoffman holds a 12-shot lead heading into the final round. Jack Roemer and defending champion, Matthew Briggs, lead the Boys 14-15 age division. Roemer and Briggs finished the first round at 3-over-par 74. Briggs carded two birdies on the back nine to along with 11 pars on the round. Roemer’s first round was highlighted by five birdies, two on the front and three on the back. Ian Johnston holds a one stroke lead in the Boys 16-18 age division after carding a 2-over-par 73 in the first round. Johnson recorded a bogey-free back nine with two birdies in round one. Noah Hartman and Bo Weissenfluh are T2 heading into the second round. Both players finished round one at 3-over-par 74. Click here to view full results. The final round of the John Deere Classic Junior Open tees off tomorrow at 8 a.m. (CT) off holes one and 10 at TPC Deere Run. Click here to view tomorrow’s pairings.